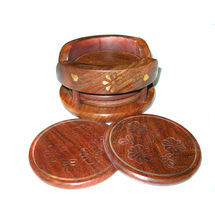 This beautiful and decorative Sheesham Wood Coasters set designed with the unique work of different color gemstone framed on the one side of Coasters wall by using glass and wood beading case, which is also a specialty of Rajashthani Handicrafts. 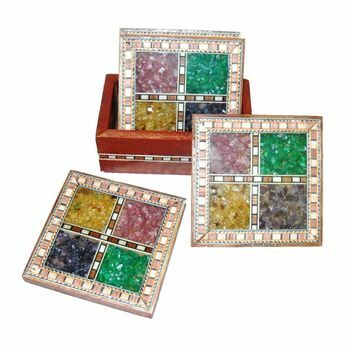 Other side of the coasters comes with colored kushan which helps the coaster avoiding slip and scratches on the surface, where these are kept. 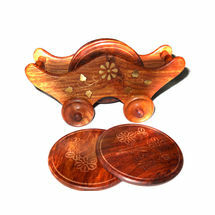 This decorative Coasters stand will give an artistic touch to your office table, dining table or Central table and also a very nice gifting idea when you are looking for unique and decorative gifts for various occasions like Deepawali, Birthdays, office inauguration, house warming function, and as a wedding return gift. 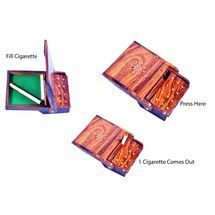 We can also get this product customized and personalized with the painting of your choice if you need this product in bulk quantity like minimum 100 pieces. Customization and personalization requirement may be like you have a marriage at your home and you want to give a memento to your guests with the memories of this wedding, then bride and groom names can be printed in required possible colored background along with flower design and all. Or if you are from an organization or corporate and have a need of promoting a product or your brand, then this painting can be changed to your product picture or brand logo with required color and same can be used for gifting. 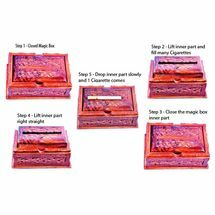 In any of these cases, you can contact us directly and we can full fill your requirement. 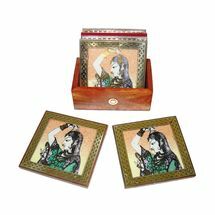 This beautiful and decorative Sheesham Wood Coasters set designed with the unique work of different color gemstone framed on the one side of Coasters wall by using glass and wood beading case, which is also a specialty of Rajashthani Handicrafts. 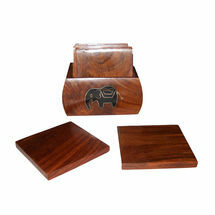 Other side of the coasters comes with colored kushan which helps the coaster avoiding slip and scratches on the surface, where these are kept. 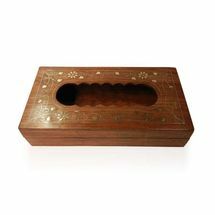 This decorative Coasters stand will give an artistic touch to your office table, dining table or Central table and also a very nice gifting idea when you are looking for unique and decorative gifts for various occasions like Deepawali, Birthdays, office inauguration, house warming function, and as a wedding return gift.We can also get this product customized and personalized with the painting of your choice if you need this product in bulk quantity like minimum 100 pieces. 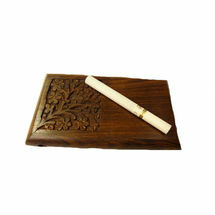 Customization and personalization requirement may be like you have a marriage at your home and you want to give a memento to your guests with the memories of this wedding, then bride and groom names can be printed in required possible colored background along with flower design and all. Or if you are from an organization or corporate and have a need of promoting a product or your brand, then this painting can be changed to your product picture or brand logo with required color and same can be used for gifting. In any of these cases, you can contact us directly and we can full fill your requirement.